Bangalore is home to around 50 lakh two-wheelers, making the city roads quite congested. With so many vehicles plying the roads, the chances of minor and major accidents is quite high. Paying for own damages and third-party liabilities can leave a serious dent in one’s pocket. Therefore, it is important to have an insurance policy, not just because it is mandatory, but because it will provide financial cover if anything were to happen. In Bangalore, there are a number of insurance companies that provide two-wheeler insurance policies. When you opt for a two-wheeler insurance policy, you can benefit from the facility of cashless settlements. Insurance providers usually tie-up with garages across the country to make the insurance process smooth. If the insured person gets his bike repaired at a network garage, then the insurance company will directly settle the bill for the repairs with the garage. Any amount over and above the insurance cover, or any part of the bill that is not covered by the insurance policy will have to be paid for by the customer. Insurance companies have a locator on their official websites. Customers simply need to enter their city and location to find the network garages in their area. A list of cashless garages may also be included in the brochure or policy document issued to the customer. Alternatively, customers can call the customer care service to get assistance on locating a network garage, or to find out if the garage is a part of the cashless network. Cashless settlements are a blessing for many as this facility takes care of most of the expenses without burdening the person insured. The processing time is shortened because the information required is much lesser since the garage and the insurance company are tied-up. There will be lesser hassles and the turn-around time for approval and claim settlement will be shorter. 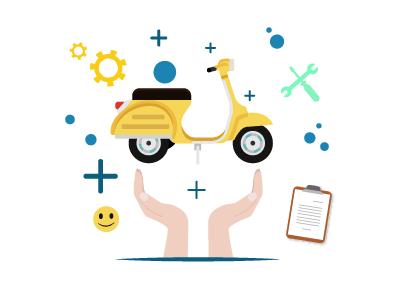 After intimating the claim to the insurance company, the insured person has to take their two-wheeler to a network garage for repairs. All that is required is the policy number along with a few other documents, if needed, to process to the claim. The garage will contact the insurance provider and get an approval. Once the approval is given, the insurer will settle the bill directly with the garage. Customers may have to pay for any part of the bill that is not covered by the insurance plan such as depreciation on spare parts of the vehicles. Out-of-pocket expenses are limited to only what the insurance policy does not cover. When it comes to purchasing an insurance policy, finding the best or the cheapest two-wheeler insurance company is relative to each person. Premium rates depend on a number of factors and can vary between different customers who wish to avail a policy from the same company. A number of factors come into play when finding the ideal bike insurance policy. You need to determine whether a third-party liability policy is sufficient or whether you need a comprehensive package that provides full cover for both third-party and own damages. If you can afford the premiums, it is smart to choose a comprehensive package because if you were to be in an accident, the insurance plan will pay out for damages, injuries and even death caused to both parties involved. Premiums are determined by a number of factors. Insurance providers will take into consideration the make, model and cubic capacity of your bike, the city of registration and purchase, the details of the driver and so on. You can avail discounts for various factors such as safety features of the vehicle. A no-claim bonus is a discount on premium provided to customers who do not make a claim during the policy term. Upon renewal of the policy, the customer will be entitled to a discount on the premium. NCB is 20% for the first claim-free year and subsequently increases to 25%, 35%, 45% and 50% maximum. Insurers will cover up to certain limits for third-party damages. Most insurers do not have a cap on the limit for third-party death claims, but for damage to property, the claims are capped at Rs.1 lakh. Opting for an insurance provider that offers cashless facilities at network garages will save you a lot of the hassle involved with insurance. You will not be required to pay from your own pocket for the repairs. The insurer will settle the bill directly with the garage, however, you will be required to pay any part of the bill that is not covered under your insurance plan. If you are selling your bike, you will need to transfer the ownership of the vehicle. You can also transfer the bike insurance policy to the new owner. To transfer the ownership of the two-wheeler, you need to inform the Regional Transport Authority (RTO) of the sale and apply for a No Objection Certificate (NOC). You need to hand over the necessary documents to the new owner to ensure the sale is done legally. Contact the insurance company and inform them of the sale and your intention of transferring the insurance policy to the new owner. Avail a no-claim bonus certificate if you have accumulated any in your policy. The no-claim bonus is non-transferrable and will remain with you. This certificate will ensure the bonus remains in your name and you can then avail the same benefit if you take out a fresh insurance policy on another vehicle. The new owner will have to provide their details as required by the insurance company. If he/she is eligible for the existing plan, the policy will be transferred to the new owner. Transferring the ownership and the insurance policy in the correct manner will ensure you do not face future liabilities.